First and foremost, a few of our community members discovered that Halo 3:ODST will have the same online-to-local co-op restrictions as Halo 3. 2 players per console, period. Yes, that does include Firefight mode. "That means in order to play on the same screen as four friends, you’ll have to System Link a couple of Xboxs together with two copies of the game. A little disappointing, but this also applies to the similar Horde mode in Gears of War 2 and Left 4 Dead as well." Or, you can play 2 players local, and 2 players online - still a bummer of a restriction for those stoked for Halo 3: ODST's Firefight mode. The second Firefight restriction noted, was the lack of a Matchmaking mode. That's right, Halo 3: ODST will not have matchmaking for Firefight mode. You'll be dependent to rally your troops on your own - good thing you have us, Right? "Unfortunately it seems you will have to rely on your friends, or recent players, list to play ODST with anyone…for Firefight is based upon the co-op model of Halo 3, according to Bungie Producer Curtis Creamer." Halo 3's Matchmaking mode only works for versus games; in order to organize a co-op night, you have to know the people you co-op with. For Firefight mode, however, it feels like that should have come standard given the type of co-op it is. 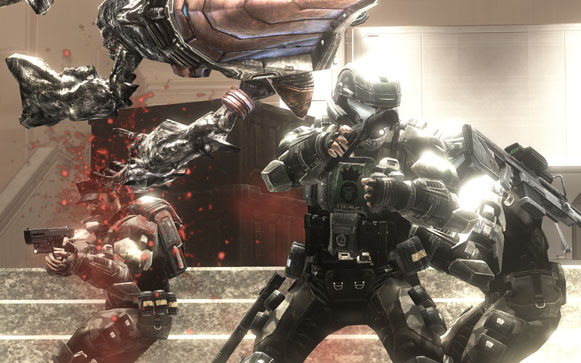 As a reminder, there will be no duel-wielding weapons in ODST, the mysterious Covenant race called the "Engineers" will finally make an appearance, and we will see the return of the Mortal Kombat style announcer to reward us vocally when we get a "TRIPLE KILL!" And finally, Editors personal downer; My beloved Elites will not be making an appearance in Halo 3: ODST. A piece of me died when I learned that the Elites were completely left out of the Halo 3: ODST storyline, for whatever good reason. First, we lost our "WOTWOTWOT," when Halo 2 taught Elites to speak, and now they're just a memory. Page created in 0.3355 seconds.